Canadian made Epoxy Resin now available on our website! Welcome to our new web store! Finally our customers can now purchase our Resins via our website! We started this company so that we could provide a quality resin made locally that is free of nasty VOCs. Our Resins are easy to use (1:1 Mixing Ratio) and will produce a beautiful glossy finish to protect your desired masterpiece. Our website is currently serving the Canadian market only, with $5.00 flat rate shipping! International customers may send inquiries to info@resinate.ca for orders. Is there anyone selling your resin in Ontario? Not at the moment, we ship across Canada though from our office in Calgary, only $5 flat rate for shipping! Does this resin work for garage floor coatings? It does but the cost is quite high for large projects like flooring with our current packaging. It does work well for floors though. Does your product yellow at all over time at all? Hello, our regular resin if exposed lots of UV will eventually yellow. Our professional resin though does not yellow due to UV. Can you use this product with oil paints? I came here to ask that question! I have some oil and oil pastels I’d love to try this on! Is your professional resin Food Safe ?? Only our regular resin is currently certified food safe. They are both a 100% solids product though with no VOCs. Is your epoxy casual food contact safe or approved for full contact? It’s approved for incidental contact only. So lets say i glitter a cup white using epoxy method to adhere glitter than the pro to seal. So I should not be using the pro as a final coat on cups? the UV can still penetrate through the Pro and yellow the regular epoxy underneath. Though the pro won’t yellow, the regular epoxy underneath may yellow and that can show through. We don’t currently have one. We are looking at a few options and if they are feasible for us to introduce then we will. Our regular resin can be used for this. Just keep in mind that if you are doing a completely clear piece, that if you pour too thick of a coat, that the resin may go a bit cloudy. 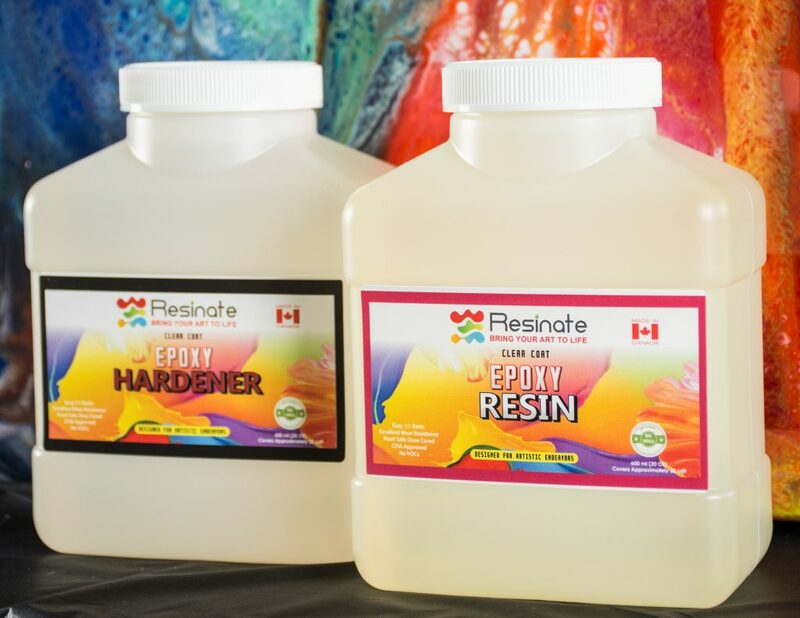 Resinate on Canadian made Epoxy Resin now available on our website!